The Newest Rant: I Love It--Batman And Robin Volume 3: Batman and Robin Must Die! 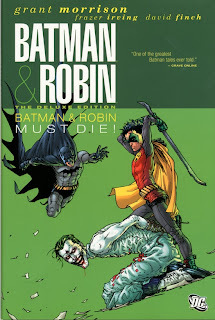 I Love It--Batman And Robin Volume 3: Batman and Robin Must Die! 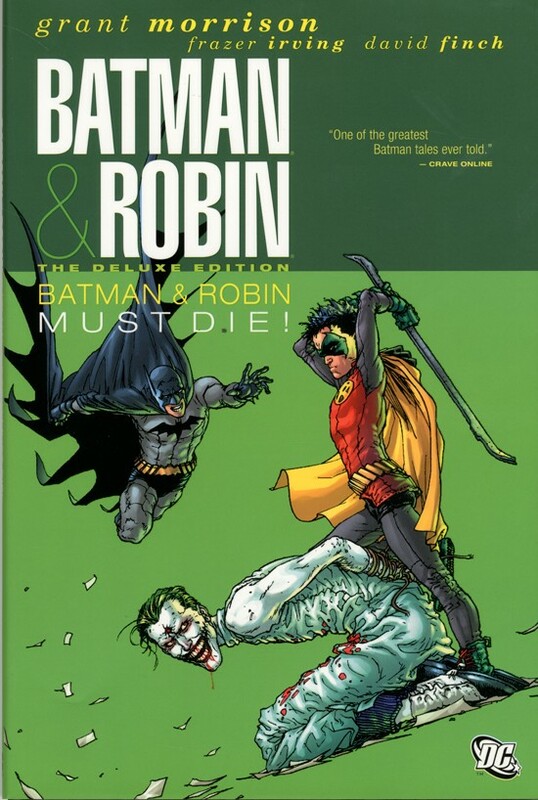 Batman and And Robin Volume 3: Batman and Robin Must Die! This collects issues #13-16 of Batman and Robin along with Batman: The Return and is probably some of the best Batman stuff Grant Morrison has done. There is a reason that I said Batman and Robin #13 was my favorite individual issue of a comic in 2010, and that reason is that this arc rocks. 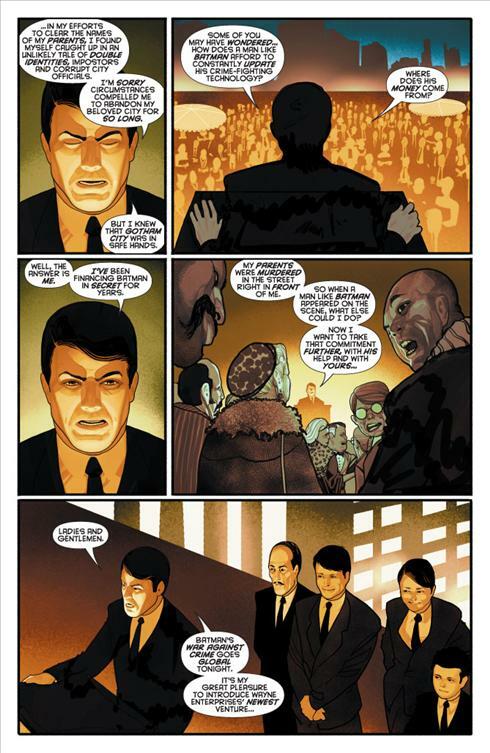 Grant Morrison meant for issues of this comic to line-up with "The Return of Bruce Wayne" which I reviewed a bit earlier, but due to various delays in comics that didn't happen. 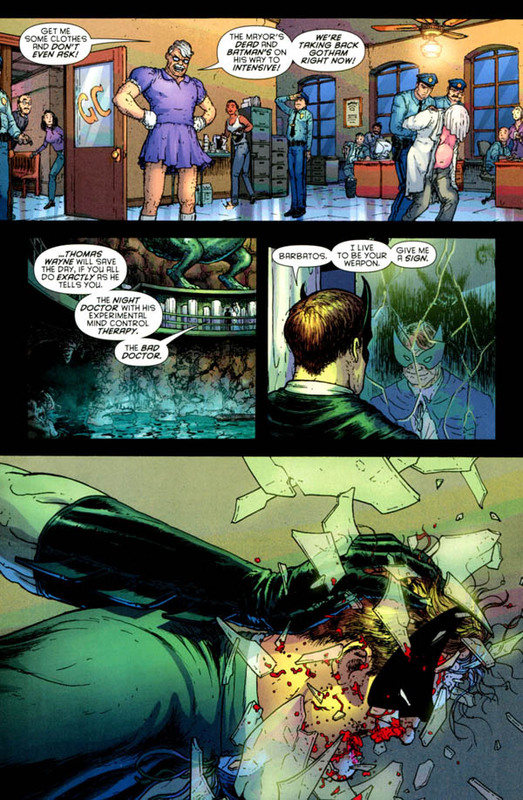 It was hoped they would line up because certain events in each comic sync together, such as the Bruce Wayne Batman returning in Batman and Robin #16. 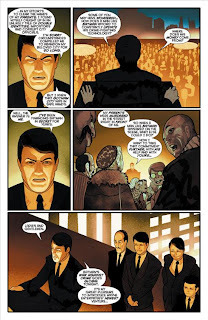 Also, in issue #16 Frazier Irving doesn't do all the art for the issue making for a few jarring shifts in style. I say these complaints first because they are all of the ones I have. After that I just love Batman and Robin #13-16. An addiction that spreads via a cold, Professor Pyg being his crazy self, more of the faux-Thomas Wayne AKA Doctor Hurt fellow, and Frazier Irving doing some of the best art I've seen him ever do. Yeah, this is the kind of stuff that reminds me why I read comics. These were of course Morrison's last issues on Batman and Robin before switching over to Batman Inc. which I haven't done any reviews of because I am thinking of doing a mini-run review of it instead of just discussing single issues, but I digress. Anyways, these three issues are amazing stuff and a culmination of sorts of all the Black Glove business Morrison brought into play during his time on the main Batman book. Plus, as I said Frazier Irving turns in some crazy-good art, with the other people contributing for issue #16 doing a fine job too even if their style is quite different. 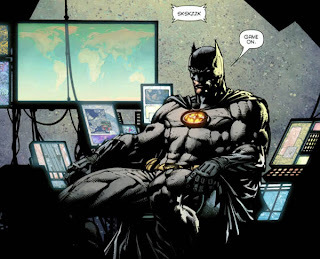 There is also, Batman: The Return, which is a prelude of sorts to Batman Inc. with a new big enemy and some setting up of who will be where for Batman Inc. It also is illustrated by David Finch so if you like his drawing, great, and if you don't...well, you're S.O.L. on that one. I myself kind of like it sometimes but found he sort of did a lackluster job here--but I don't really care as I picked up this book for Batman and Robin #13-#16 along with the neat extras in the back of the book so that last story is really just a bonus thing in my view. The subject of this post summed up my point, I love this arc, I love Grant Morrison's Batman whenever he is writing it regardless of whether it is the main Batman book, Batman and Robin, or Batman Inc. and I love it when a comic genuinely makes me feel all warm and fuzzy inside. This is awesome, read all the stuff you need to in order to understand this story arc and then read this hardcover/pick up the issues/wait for the trade/whatever. Just make sure you read it! Batman & Robin Vol. 3: Batman Must Die! You really should read it somehow, maybe buy it via a link!